IKEA offers first look at SYMFONISK Sonos speakers | What Hi-Fi? With just a fortnight to go until IKEA launches its highly-anticipated SYMFONISK range in collaboration with Sonos at the Feel Home exhibition in Milan (which begins on 9th April), the Swedish furniture company has released two images of the SYMFONISK WiFi bookshelf speaker. Before now, the most we had seen of the forthcoming speaker was a crude prototype and a teaser video revealing its packaging. 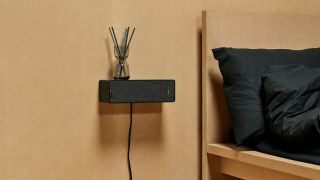 The speaker looks as we expected - rectangular, compact, discreet and able to double as a bookshelf or bookend, as the two images (above and below) show. It has just picked up one of the seven Red Dot design Awards awarded to IKEA for various appliances - hence the early reveal. We still have to wait for the official launch to discover full details of specs, features and pricing, although IKEA has already confirmed an on-sale date of August. We also expect the pricing of the speaker – or speakers, perhaps – to come in under Sonos' own wi-fi speaker line-up, which starts at £140. After all, IKEA Home Smart product developer Stjepan Begic has previously remarked that price will be at a “level where we can reach many people”.